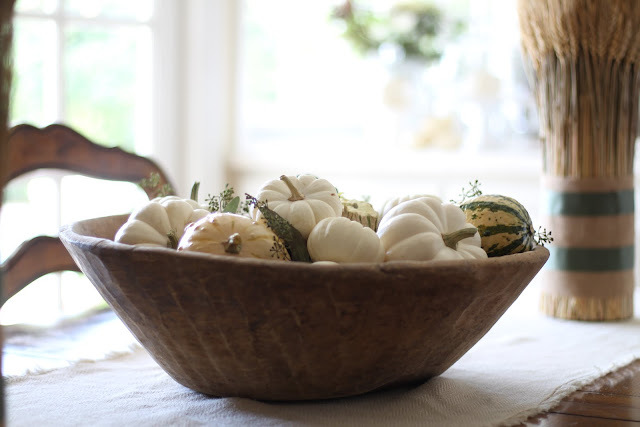 Welcome to my fall home tour, and if you have come over from Fox Hollow Cottage, hello and welcome! I am so excited to be participating in the Autumn’s in the Air blog hop with eleven of my very favorite bloggers. Each of us is featuring some of our favorite things for Fall. 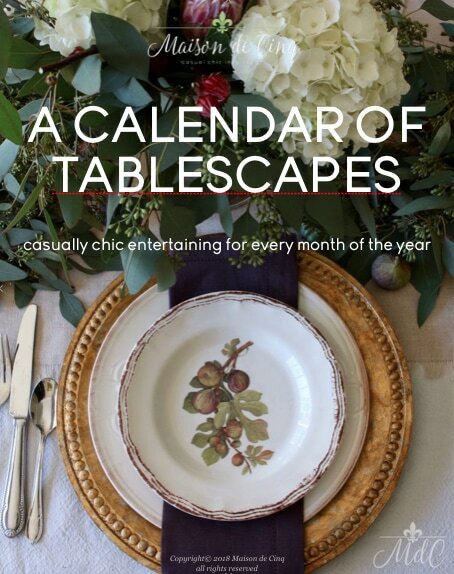 Some are doing tablescapes, some are doing a room or two, and some a full fall home tour. I think you will see some very beautiful and inspiring spaces as these girls are good! 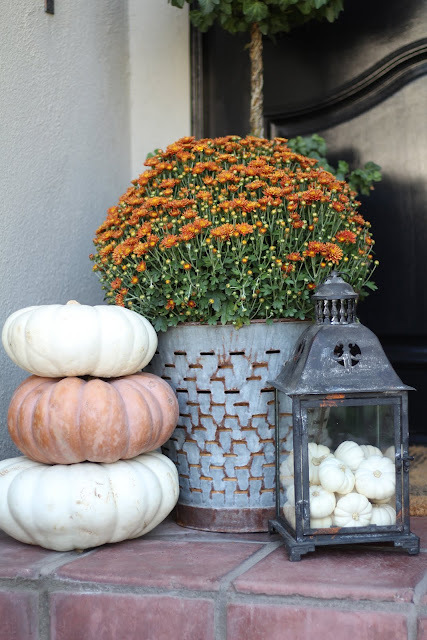 Last year I did very neutral fall decor with white mums, lots of white pumpkins, and almost no color. 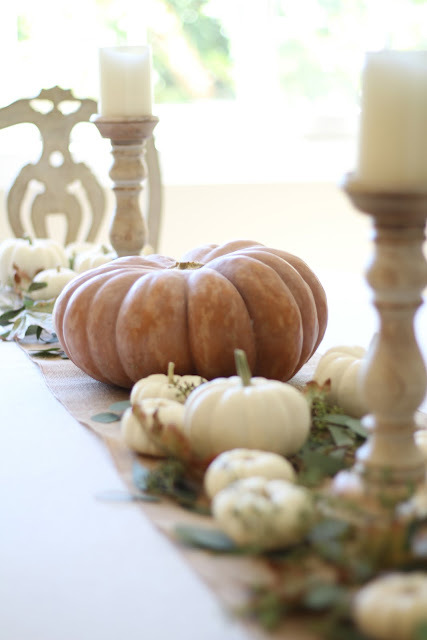 And although I love a neutral fall look, this year I wanted to do something more traditional…. but not too traditional! 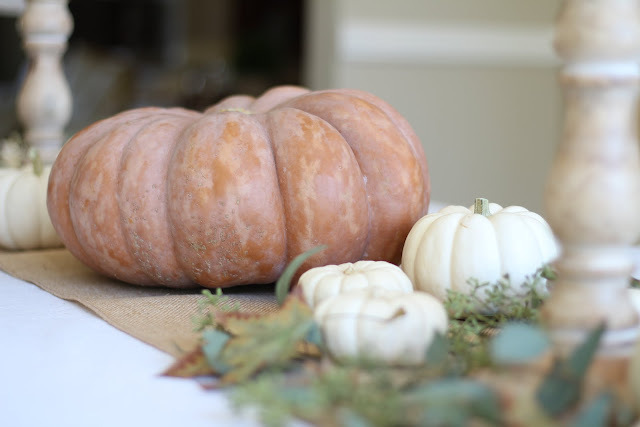 I’m not a big fan of bright oranges, but I did find myself gravitating toward the subtle fall colors of muted oranges, faded yellows, browns, and greens so that’s what I wanted to showcase this year. I used a lot of natural decor while still hopefully having it feel cozy and warm. So grab a cup of coffee, and come on in! Welcome to my fall home tour 2016…..
My front porch this year. When I found these mums at Lowe’s a couple of weeks ago, it just set the tone for the whole season. The olive bucket is a vintage find and the lantern is a Home Goods find from a few years ago. My dining table with an array of pumpkins, fallen leaves from my yard, and some eucalyptus. 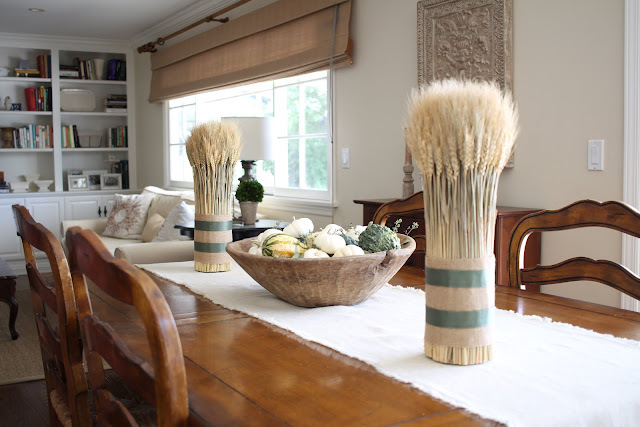 Wood candle holders are from Pier One Imports and the burlap runner I purchased on Etsy. 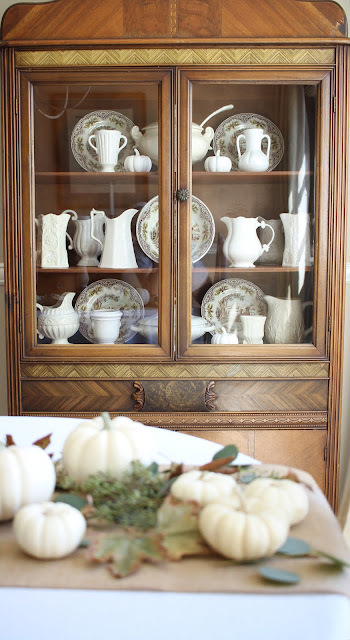 In this china hutch, I always have some of my vintage white ironstone and then I change out the plates for the different seasons. I just found these pheasant plates at Home Goods recently and I’m in love! I’m planning on doing a tablescape with them soon! These pillows were a new find. Loving the yellow/citrine color for fall! 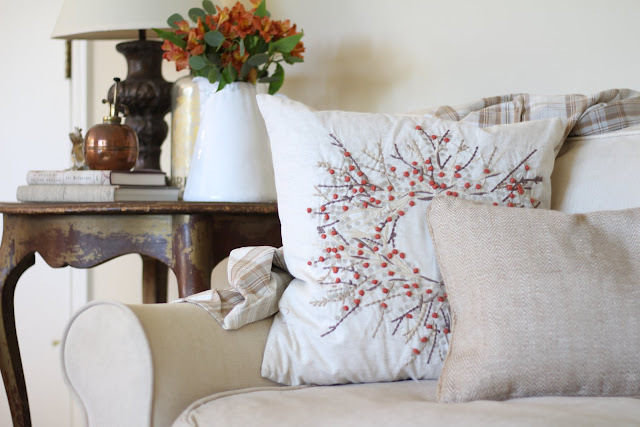 The urn is a French antique and the pillows are from Home Goods. Another of my “foraging” finds! These leaves were found on a hike near my house and I just loved the colors. I added some muted orange flowers in the family room for a pop of color. 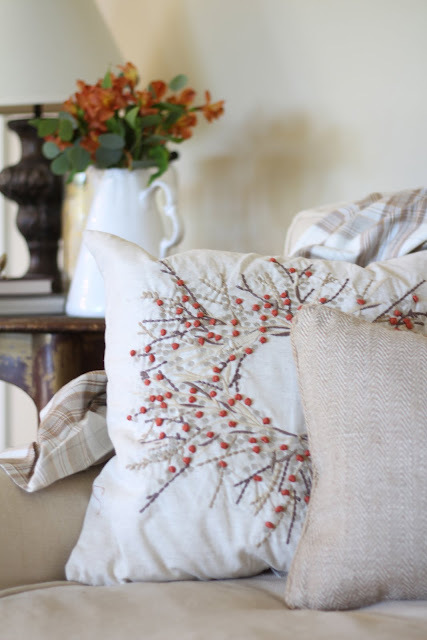 I love that they bring out the muted orange in the pillows. 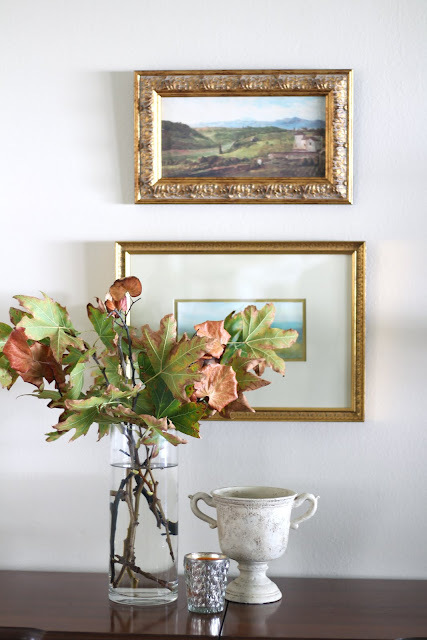 My kitchen mantel is another place where I love to change things out with the different seasons. Here I have some more ironstone pitchers and I switched out my blue and white transferware platter that’s usually there for this neutral wood platter and added some ceramic pumpkins from Target. If you’ve been reading my blog for awhile you know I have a love affair with cloches! 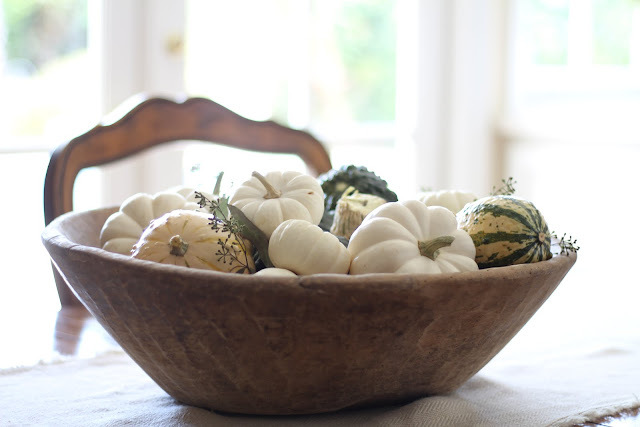 Here I used them to hold my mini white pumpkins and added some fall flowers to the counter, too. In the background is a coppery pumpkin I found that I love! The color is so perfect! 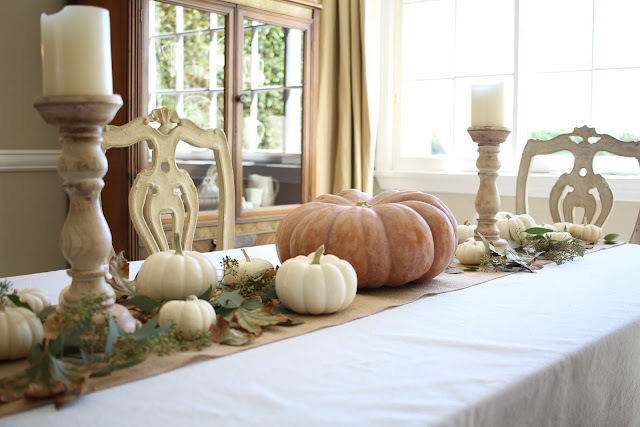 The pitcher is vintage, cake stands are old, and the coppery pumpkin is from a local boutique. I knew I wanted to use my antique dough bowl in here but I wasn’t sure at first what I wanted to put in it. 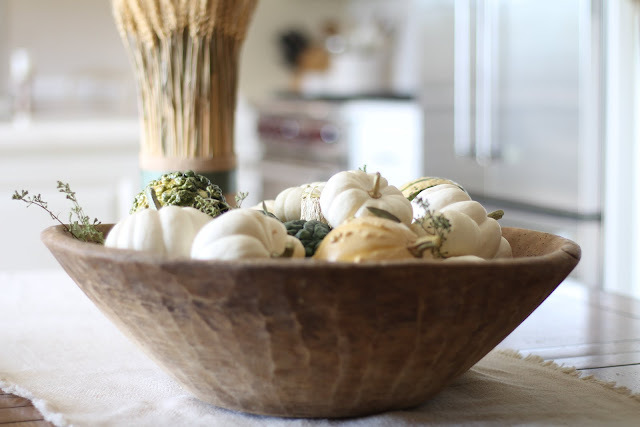 Then when I found the shafts of wheat stored away I let those set the tone for the bowl, using white and green gourds and pumpkins, with some eucalyptus tucked in. 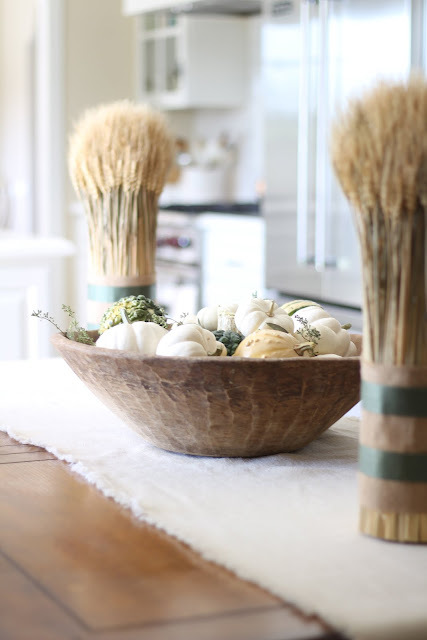 Wheat shafts were from the grocery store a few years ago, the runner is from Pottery Barn, and the dough bowl is an antique. Thank you so much for stopping by my fall home tour! Hopefully you’ve been inspired and had some fun! Please go visit Buckets of Burlap next, and then onto each of the bloggers in the tour. 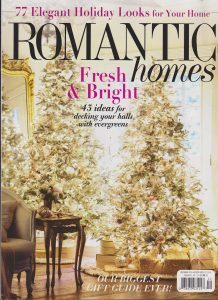 I think you will be amazed at the talent and get some great ideas for fall decorating! Aww.. thanks so much Shannon! You are the best! And I am soo glad that you could be a part of this – thank you so much for joining us! Summer! You are possibly the MOST supportive person ever! Thank you for always saying such wonderful comments and for being so sweet! And I am so, so glad that you could be a part of this! Sheila! What a gorgeous tour! 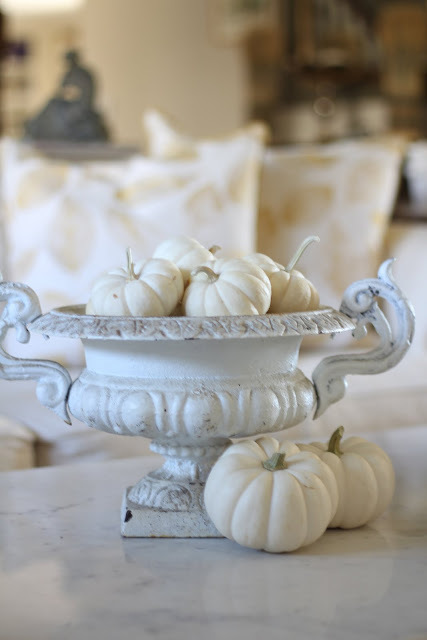 I'm obsessed with the french urn and the antique dough bowl!! 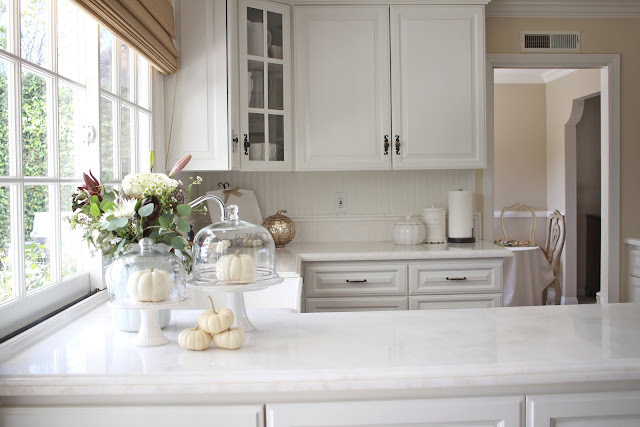 Love the soft colors with a nod to the traditional. Classic and elegant! It's been great working with you!! What a gorgeous tour, Sheila! I just love the soft fall colors you used. 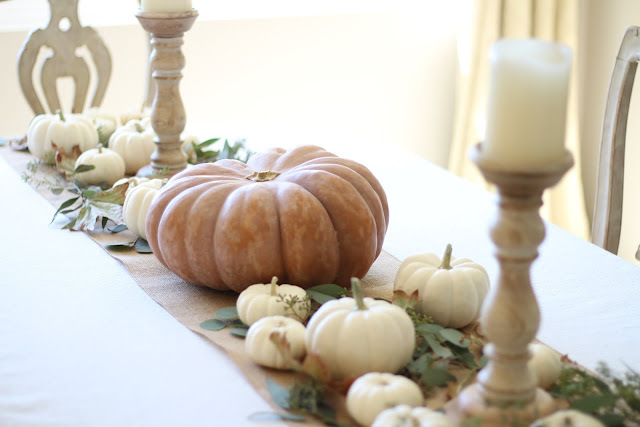 Your tablescape is stunning, and I adore how you incorporated so many natural elements! Love it all! I love all the soft, muted tones.. and the natural elements. 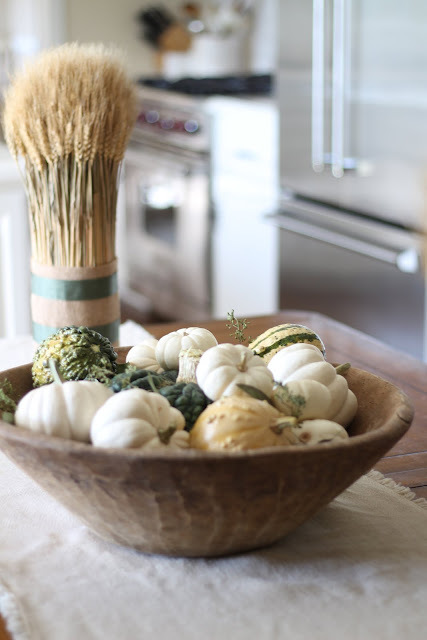 Love all your touches of fall…..so beautiful! Sheila, I LOVE all your fall touches! 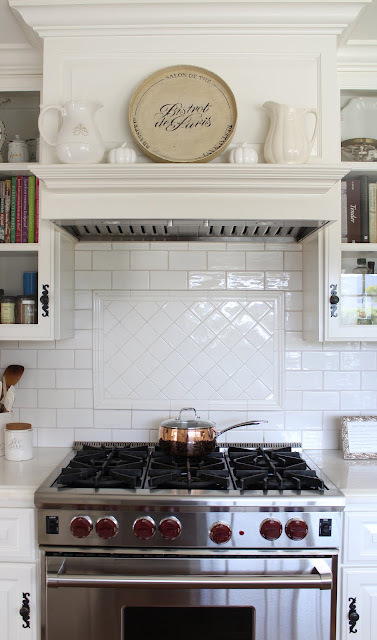 And, I am so jealous of your kitchen mantel! Perfect seasonal additions while staying true to you. Awesome. Oh wow Sheila!!!! This is all stunning! I'm I'm love with your urn and those pumpkins! I have one I may have to do the same with. Your table is so beautifully done and I love your dining room hutch with the rich gold tones and frames. And can we talk about those fall leaves?? Oh how lovely!! So brilliant and I love every detail. So honored to be a part of this tour with you today. Thank you so much for inviting me to be a part of it! xoxoxo…. 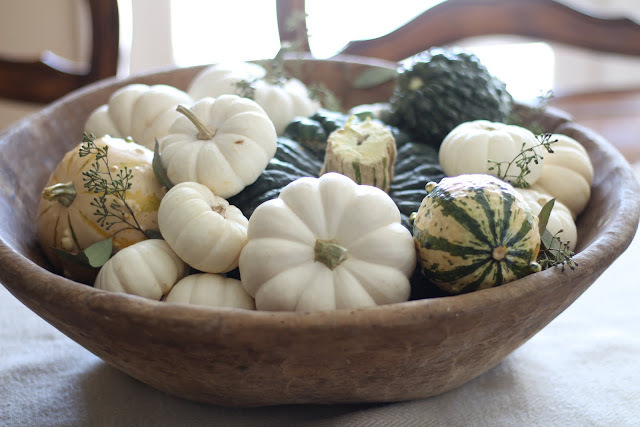 Sheila, all your fall decor is so beautiful! I love how you added color but still kept it soft and neutral feeling. You are so talented with your styling and photography! What a gorgeous Fall tour, Sheila! 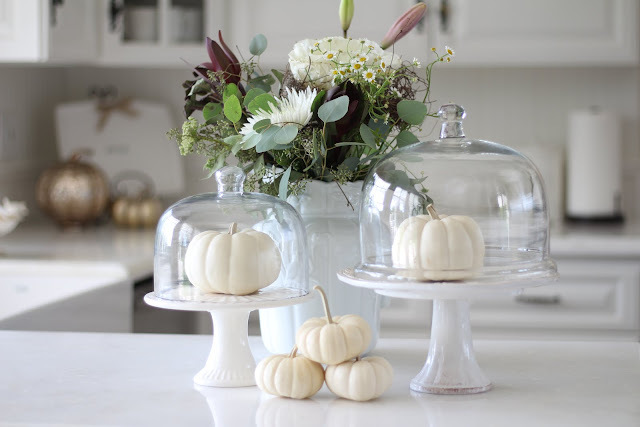 I love your dining room tablescape with your muted tones … your foraging finds are perfect … and, well, you know that I love the beautiful vignettes you create with your love for cloches! So much attention to detail and inspiring! It all makes me want to redo my house now! 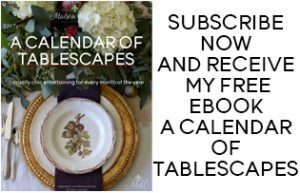 Thanks so much for inviting me to be a part of this blog hop … what fun!